In late January-early February, St. Cloud Tech painted itself into a corner in the Section 8AA playoffs with a five-game losing streak, including defeats to Moorhead and Roseau. It seemed inevitable that the Tigers would have to endure another season without a state bid, the 59th straight since they last made it to St. Paul in 1952. But before the paint could dry on another season, the Tigers have come roaring back. First-year coach Neil Andruschak emphasized defense for his team, knowing it would be key to a winning season and the school’s best shot at the state tournament. After some ups and downs as the players adjusted, a recent flourish gives them momentum heading into the playoffs. And the player leading the charge has been junior center Brandon Reinholz. “We always talk about solid defense creating great offensive chances, and I think it took a few games for Brandon to get comfortable with a new system that always comes with having a first year coach,” Andruschak said. “He is comfortable in that system now, and his creativity is starting to really show. During a three-game winning streak, Reinholz has tallied six goals and five assists. He had two goals and four assists in a 7-5 victory at Little Falls on Feb. 9, then scored the game-winning goal in a 4-2 win at Willmar on Feb. 11. Finally, he notched a hat trick and an assist in a 5-4 overtime upset of Roseau, one of its bitter Section 8AA rivals. “In terms of momentum, it made the impossible seem possible for us,” Andrushak said. “We haven't beaten Roseau since '03 and had never beaten them in their barn. Now we have. “I think that my boys need to believe that they can skate with their opponents. They need to believe that they can score or defend when they need to. Stringing together a few wins is a great way to keep the locker room positive and focused on the right things heading into playoffs." is 21 goals and 38 points lead the team. On Monday, Feb. 16, the Breakdown spoke to Reinholz about his scoring outburst, the upset of Roseau last weekend and the merits of painting flying fish. Breakdown: To what do you attribute your scoring explosion? What has been going right for you? Reinholz: (I) just started off slow and kept going until it all started rolling. Pre-game routine has become a big part of my game. I just kept firing at the net and the goals started to come. Breakdown: How big is the victory over Roseau, both for that momentum and for section seeding? Reinholz: It really gets up pumped up for playoff time and reassures us that we can play with anybody in the section and that we could make a good playoff run this year. I think that the win against Roseau will help us get that fourth playoff seed and get that first playoff game at home. Breakdown: What kind of goals do you have for sections, both individually and as a team? Reinholz: As a team we want to go deep in and hopefully win the section. Individually keep working hard, moving the puck around, get some more goals, keep winning and have fun in the playoffs. Breakdown: Give me a short scouting report on yourself as a player? What are your strengths on the ice? Reinholz: I can play physical, good on the draws, can put the puck away and find the open man. Reinholz: (In the) off-season, train five times a week in the morning. Try and eat well. In-season, work as hard as I can in practice to keep in shape. Just working as hard as I can all the time. Breakdown: Can you tell us one unusual thing about yourself that others may not know? Reinholz: I really like art. I like to draw and paint. Flying fish are my favorite subjects. Breakdown: What other activities are you involved in outside of hockey? Reinholz: Working hard in school and trying to hang out with friends during my free time. I’m not involved in any other sports. Breakdown: What's the best part of playing high school hockey and why? Reinholz: Playing with all your friends. It is really fun to come to the rink every day, hang out with your buddies, work hard for each other, and being able to compete against really good teams all over Minnesota. Credentials: Reinholz leads the Tigers in scoring with 38 points and 21 goals. 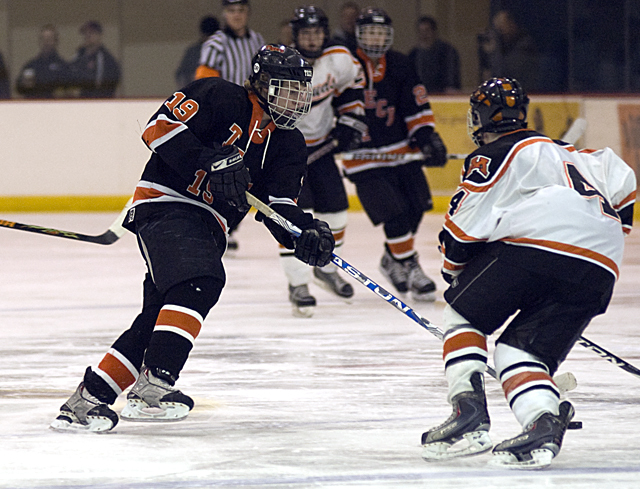 ... had two goals and four assists in a 7-5 win at Little Falls on Feb. 9. 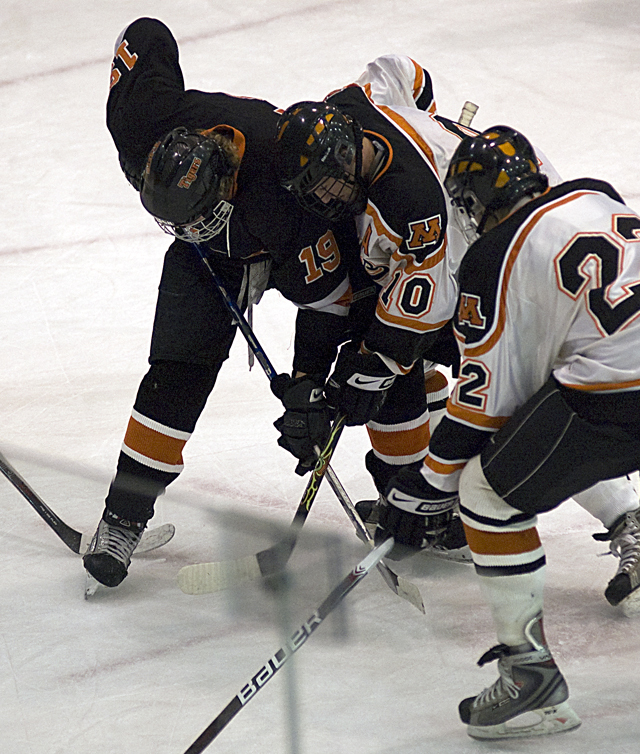 ... scored the game-winning goal in a 4-2 win over Willmar on Feb. 11. 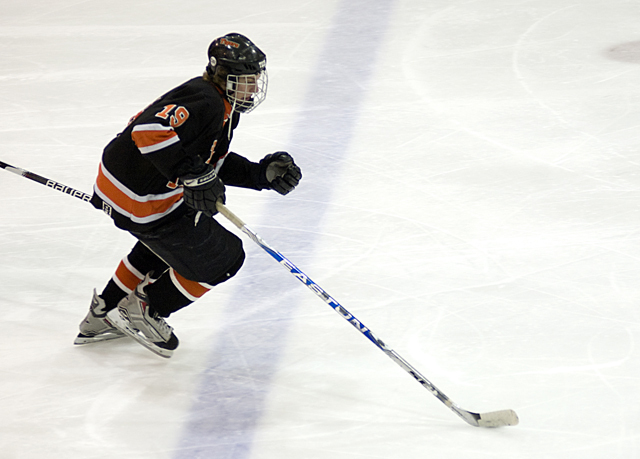 ... notched his third varsity hat trick and added and an assist in a 5-4 overtime victory at Roseau last Saturday. It was Tech’s first win over the Rams since 2003. ... would love to play junior hockey after his high school career with an eye towards playing at a DI school. Breakdown editor Tim Kolehmainen may be reached at tim@mnsportspreview.com. We preview every high school program in the state, from Kittson Central to Red Wing, Silver Bay to Luverne and all schools in between. Player profiles on the Super 100 seniors, Top 75 juniors, Elite 50 sophomores/freshmen, along with dozens of Q and A player features. Program profiles on every team in the state. Season schedules for every program in the state. Extensive section previews on all 16 sections in Class AA and A.
Four-page feature stories on eight programs from around the state. Hundreds of photos of players and coaches.